When we first set out to create a ‘safe’ sharps disposal container, little did we know the journey we were about to embark upon. What we would learn over ten years of clinical trials and research, extensive design R&D, microbiological testing, and movement mapping, was that the solution to safety and risk prevention in sharps disposal was not solely “a container”--it was so much bigger than that. So let’s explore a potential container journey within an inner city hospital…. Daniels containers are delivered to a hospital loading dock in a Daniels bulk transporter. 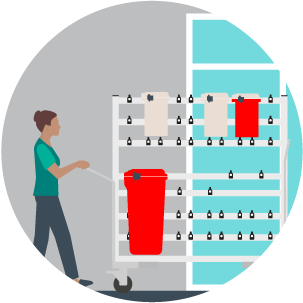 In transport, the collectors are suspended on multiple tiered rails; all collectors are secured upright by interlocking rail hooks on the back of each collector, and rails are vertically spaced to ensure collectors do not impact each other in transport. Once off-loaded from the truck, our collector is moved into the hospitals' clinical environment via a bulk delivery cart. Evenly spaced pegs across two horizontal rails firmly affix to a design recess in the side of each container. The equal-depth design of all Daniels S-Series containers enables a flexible combination of multiple container sizes being transported, whilst again achieving off-floor suspension and fixed upright movement. Multi-container transport reduces labor and alleviates the pressure on internal service lifts and narrow corridors. 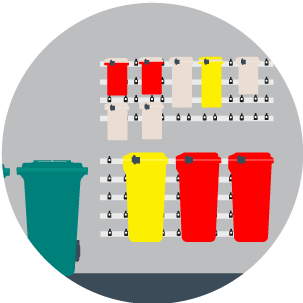 This hospital opts to store multiple containers in their utility rooms to efficiently cater for the ward’s high volume turnover. Two Daniels’ Wallsmart panels have been fixed-mounted to one of the internal walls enabling the direct transfer of containers from the internal delivery cart to suspended wall mounting. 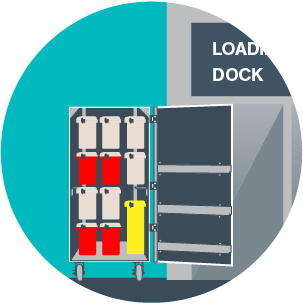 Utilizing once again the peg system that has been designed for interlocking Daniels containers, the Wallsmart peg system enables multiple container combinations and easily identifiable ‘empty/full’ container separation if used as a transfer area. 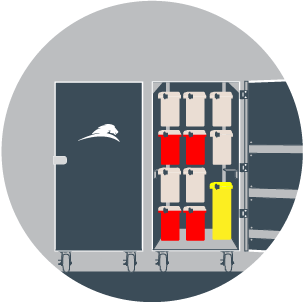 When an empty sharps container is required at ward level, the nurse or internal field service technician transports multiple containers via an internal delivery cart, or alternately, mobilizes a single unit on a Daniels CartSmart trolley for bedside use. Engineered to achieve both locked static positioning and ease of movement, the Daniels Cartsmart Trolley is best utilized for mobile point-of-use positioning at patient care. The soft close mechanism minimizes odor reduction and its hands free foot pedal eliminates touch with the surface of the container. A side mounting bracket affixed to either side of the trolley enables a second container to be co-mounted for point-of-use segregation of dual wastestreams. 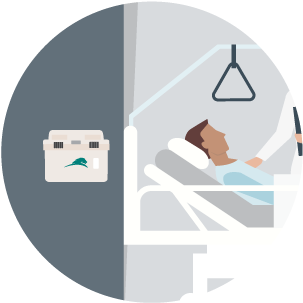 Within the hospital environment, the volume capacity, positioning and access needs of sharps containers vary from ward to ward; from dialysis to critical care, from surgery to cardiology, our interchangeable accessories cater for seamless movement across an entire facility irrespective of the size of collector, volume or useage requirements. Fixed mounting brackets in patient rooms enable containers to be wall mounted for recurring use; the dovetail design at the back of each Daniels container locks downwards onto the bracket to secure the container in place. 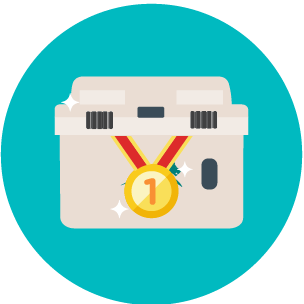 Once the container is full, a service tech scans the container barcode to identify its ward positioning for audit reporting and analysis, and engages the side-locks of the collector to prevent further access. The container is then moved to wall mounted storage within the ward’s utility room, or bulk-transported on an internal delivery cart to the hospital loading dock. At dock level, Daniels transporters optimize storage footprint significantly. 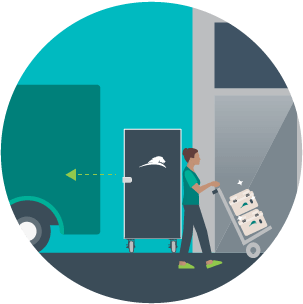 The process of transferring container directly from a cart into a transporter ensures containers never touch the ground and remain uncontaminated ready for pickup. At its scheduled pickup, a Daniels truck delivers a transporter full of clean (empty) containers, and replaces its load with recently filled containers. Repeating step one of the process, Daniels containers are transported in bulk within a Daniels transporter. 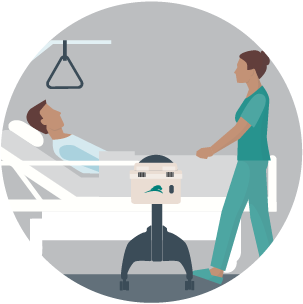 The locked upright positioning ensures contents are not put in jeopardy, transport risks are minimized, and the hospitals’ cradle to grave responsibility is protected. Once Daniels containers return to a Daniels facility, they are still in the same condition in which they left the ward. The collectors' leakproof seal has guaranteed no leakage has occurred during transit, its fixed upright positioning has ensured protection of its exterior veneer, its impenetrable casing has ensured there has been no risk of content protrusion, and its secure tamper-proof locks have eliminated unauthorized access at dock level storage and in transport. 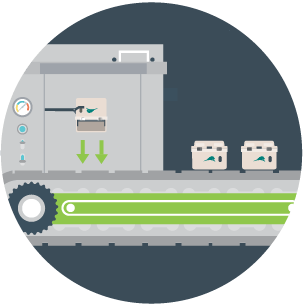 From transporter to robotic washline, each collector is loaded onto a mechanic conveyer belt; robotic arms unhinge its front and side locks, and contents are robotically emptied. This tipping technology represents a carefully engineered process that eliminates human intervention and circumvents sharps contact risk. 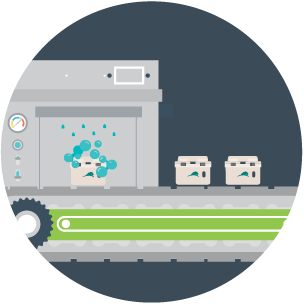 Once a container is emptied, it continues on the third stage of its journey through the Daniels robotic washline; a rigorous process housed within a conveyer-belt washing chamber which combines environmentally friendly cleaning liquids, powerful jet-blasting hoses and steam technology to achieve the highest levels of bacterial load reduction and micriobiological efficacy. The final stage of a Daniels container journey is a comprehensive quality control check. 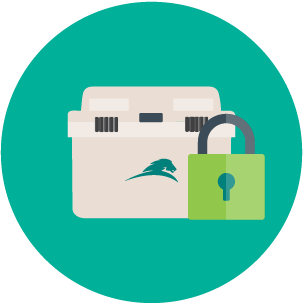 During this step of the process, our container is physically inspected; the safety tray mechanism is tested, inbuilt security locks are checked to be in working order, and once passing the quality inspection, the collector is recommissioned for another sharps containment assignment. One that includes a disposable container being shipped in a box, picked off a shelf and assembled by hand, moved through a hospital corridor on a nurses cart, and then discarded in a cardboard box once full. It doesn’t take eleven steps, it doesn’t require years of R&D or clinical trials, or necessitate a multi-million dollar infrastructure and machinery investment, but, quite simply, it’s not worth the human risk…. At Daniels we believe that lives are worth the investment we have made and we proudly stand by our decision to push the boundaries of reusable technology to achieve needlestick injury reductions that are globally unprecedented, landfill reduction that is worth writing home about, and a sense of purpose that leaves us fulfilled that every day... We Make Healthcare Safer.